Raise your hand if your life is entirely too busy, over-scheduled and over-worked with overlapping activities. All hands up? Yep, welcome to the American way. It’s probably the same all over the world, I just don’t have much worldwide first hand experience. I do know that Germans know how to Holiday, but when they are not on Holiday, it’s work work work. This year hasn’t been the easiest, emotionally or physically, for myself or for my family. Eventually it takes its toll. I love traveling to destinations to run races, but the problem is that the only time I get away from the “mommy role” is to leave town and run 13.1 or 26.2 miles. I call it pleasure travel, but at some point you have to question the pleasure of running races. You runners know what I mean, and you non runners will absolutely think that is not relaxing in any way, shape or form. It does give a reasonable excuse to eat some divine food while traveling though! This past weekend I left town for 26 hours for no other reason than to just do nothing at all. For the first time since I became a Wife and a Mother, I realized I needed a time-out. I needed to be alone so my brain could completely shut down. If you know me at all, you know where I go when I need to be refueled. Montreat called my name when I heard some of my girlfriends would be there for the weekend. Mom arranged for me to stay with someone I had never met, with whom I now adore, and as soon as Hunter’s baseball game was over I headed west. As I began the steep incline up I-40 from Old Fort I felt my shoulders sink back into place, my neck muscles relaxed and my chin began to raise a bit higher. My eyes were wider and my hands released the tight grip on the steering wheel. Peace… I was headed that way and it caught up to me before I could get there. My phone rang as I crested the mountaintop on I-40. The girls were waiting for me with dinner prepared. Oh my goodness! I didn’t have to fix dinner? I didn’t have to fix food for my family? If I just wanted a banana for dinner then that was fine, I didn’t still have to fix food for the 3 hungry boys in my house? Weird… but it made me smile! I spent the next 26 hours doing…. um…. nothing. I got caught up with my friends, we vented, we shed some tears and we offered advice and loved on each other. Later that evening, I pulled out the blankets I keep in the car for baseball games and found a place on the banks of Lake Susan to cuddle up. 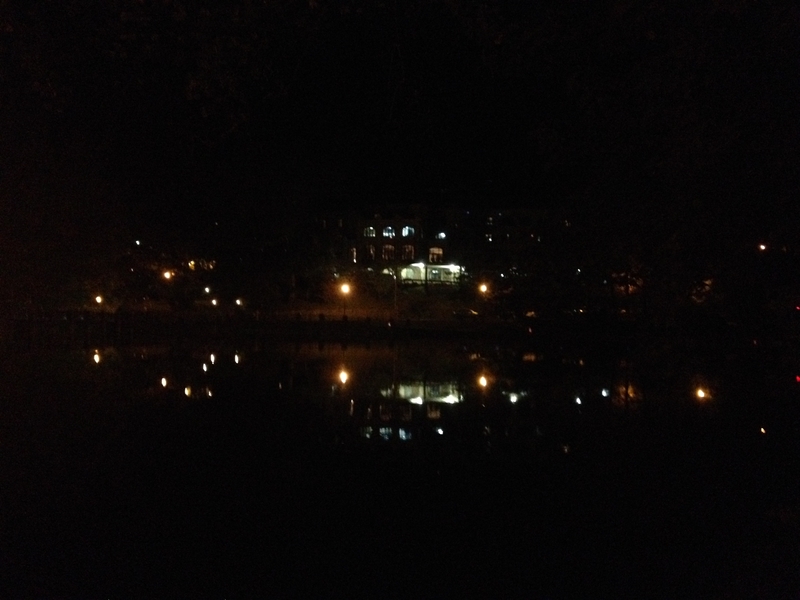 The only lights were from Assembly Inn and their reflections on the very still water of Lake Susan. I listened to the crickets chatting and the joyful noises of a choir lifting praise. I assumed they were either preparing for their service the next day or perhaps celebrating the close of their weekend retreat. I think two hours passed as watched people walk over the dam, watched the ripples in the water as fish came up for food, hummed along to the familiar music and listened to the world God gave us to enjoy. Too often we are caught up in scheduling all that is available to us and we forget to enjoy was is GIVEN to us. I’m guilty of not wanting to miss a great opportunity, not wanting my kids to miss out on something or not wanting to be the only one that doesn’t take advantage of something exciting. Guess what? Something exciting is going on all around us, all the time! It’s free and it’s always available! Trouble is, we are so busy scheduling in some other something that we miss it altogether. God created Earth the way He did with intentions for us to enjoy it. Here is what I know, even with the 97 long years that my Grandmother had on Earth, it was “a vapor that appears for a little time and then vanishes away.” (James 4:14) Because of the challenges life has brought me, I have learned to worry less about the future and live life one day and a time, doing the best I can to take advantage of each day that I’m given to breathe on this beautiful planet created just for us. Taking advantage of life doesn’t necessarily mean putting something on the calendar, unless maybe we just need to put “30 minute walk outside” on the calendar to be sure we do it. God created a cyclical world so that it refuels itself. We are included in that cycle and it was created so that it refuels us as well. Sometimes we just need to continue exhaling until our stomach reaches our vertebrae so that we can fully inhale all that is around us. Life isn’t about slowing down long enough to take a breath. Life is about engaging in what God gave us. Engaging means we stop, look, listen and then inhale the glory that surrounds us so that we can exhale beauty back into the world. Mommy needed a time-out. It was long overdue and I learned a lesson. Opportunities for time-outs are everywhere, even right here as I listen to a bird chirping outside my window. When I listen to the different chirping chatter, I realize God created each bird a little different from another, just as he created us. We are all a little different from each other. No one is exactly alike. No one person can replace another person. God made only one, so we are responsible for protecting that one, refueling that one, and allowing His peace to invade that one. Then, and only then can that one person fulfill the purpose that God intended. Making the best of each day does not mean doing everything. It means becoming everything that God purposed for us, in the simplest and purest form in which he created each one of us. Each ONE of us,and there is only ONE of us…. each ONE of us is what keeps the cycle moving. You are valuable, so take a time-out when you need to. God created the world to allow time for time-outs too. This entry was posted in Faith, Life and tagged Faith, friendship, Life, Montreat, rest. Gatewood you are amazing and I love you! After reading one of your posts, I always feel uplifted and like I had had a therapy session. Keep writing, it is your gift from God to share with all of us. You make the world a better place with each post!! !